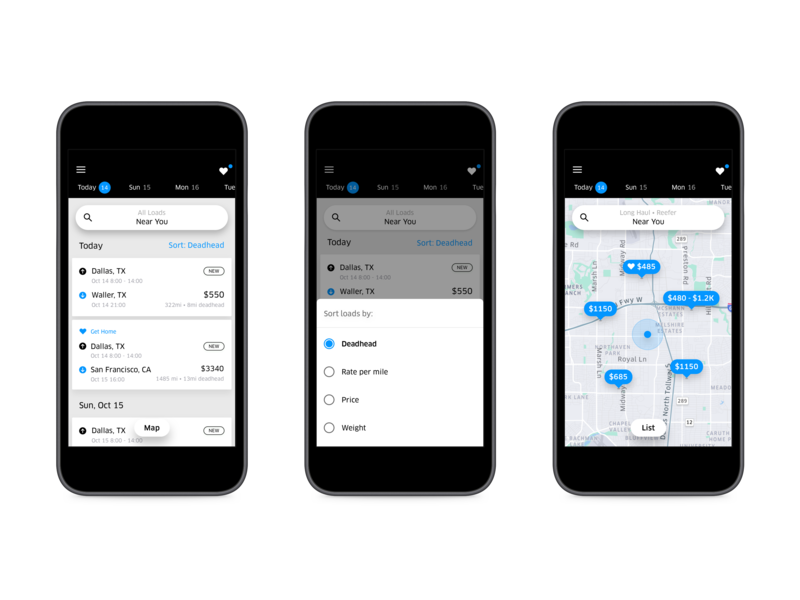 Uber Freight, the newly spun out Uber business unit, will push out an upgraded app in the coming weeks with better, more intuitive tools to help truck drivers connect with shipping companies. The redesigned and updated app comes just two months after Uber announced it would make Uber Freight a separate unit and more than double its investment into the business. That meant going to a lot of truck shows and getting the app into drivers’ hands, Schwabe added. The result is an upgraded app with new navigation features that make searching for and filtering loads easier to customize and more intuitive. The new redesign has a search bar across the top of the screen, an easy place where all of the driver’s preferences can be found. If drivers change their selections — say putting a preference on maximizing the rate per mile — the search bar will update in real time about how many load matches are found. Uber Freight also added a date picker to the app that lets carriers and their drivers jump to a pick-up date of their choosing with just a tap, so they can plan their weeks more efficiently. Drivers also can sort for the factors that are the most important to them, according to Uber Freight product manager Xinfeng Le. The search and sort upgrades will be available on iOS and Android in the coming weeks. The app is also getting an updated map view, which will roll out to all users in 2019. The map view provides a brand new way for truck drivers to look for loads around their location. The app is already equipped with a list view, which shows them many loads at once. The map view is handy because users can drag the map to areas where they’ll be traveling. Uber Freight has been scaling up its business since launching in May 2017, growing from limited regional operations in Texas to the rest of the continental U.S. The company, which is led by Lior Ron, has offices in San Francisco and Chicago. The company has launched a series of programs and features since March, including “fleet mode” and Uber Freight Plus, which gives app users access to discounts on services such as fuel, tires and phone plans. Uber Freight also started an advisory board of truck drivers and introduced a platform that lets shippers into the company’s network and lets them manage shipments directly from their desktop.